After a fun weekend that included a lot of dining out, it was good to be home this evening and restocking the fridge with some basics. I roasted mushrooms, cherry tomatoes, Brussel sprouts, butternut squash and potatoes. Plus we grilled some chicken using a gluten-free teriyaki marinade. Sounds like a lot but I purchased a lot of the vegetables pre-cut to save time and once quickly seasoned, they just cook themselves more or less. Plus I love cooking large quantities so that there is some left in the fridge to use for lunch, dinner or snacks for the next few days. For my dinner, I quickly sautéed some yellow squash and zucchini noodles (purchased already spiralized), and made this bowl. Post photo, I also drizzled it with tahini. It was fresh, simple and nourishing.. not just from a nutrient standpoint (but there are plenty of those!) but also because it is warm and cozy, and totally satisfying! Perfect for a Monday evening! 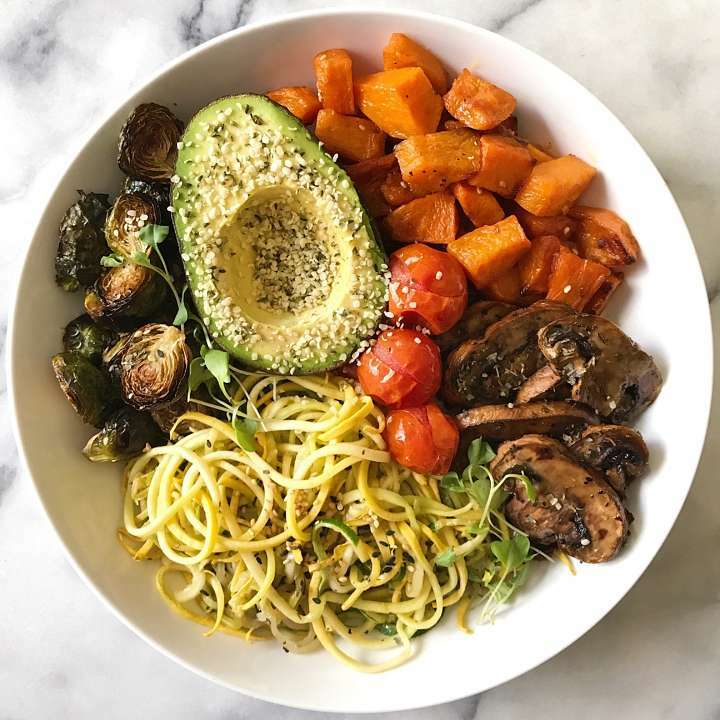 A simple, nourishing and yummy bowl that is totally satisfying! Use already meal prepped veggies or use this an an opportunity to make extra so you have some in the fridge the next day or two. Mushrooms: toss mushrooms in olive oil, then place in single layer on baking sheet. Sprinkle with lots of basil (I use 1-1½ tablespoons), salt and pepper to taste. Bake 25 minutes or until tender and just starting to get crispy. Tomatoes: Gently toss tomatoes in a touch of olive oil. Place on baking sheet. Bake 10 minutes or until tender and skin started to blister or separate from the tomato. Spiced Butternut Squash: Place Butternut Squash in large bowl. Toss with oil, cumin, paprika, and sea salt. Arrange in a single layer on baking sheet. Bake 20 minutes. Turn squash over. Bake an additional 15 minutes or until tender. For more crispy squash, bake a bit longer. Set aside. ALTERNATIVELY, if you want a simpler squash, just toss butternut squash in olive oil, place in single layer on baking sheet and sprinkle with kosher salt. Bake 35 minutes, flipping once. In a medium saute pan, heat 1 tablespoon olive oil over medium heat. When olive oil hot and shimmering (not smoking), add garlic, stir for about 30 seconds until fragrant. Add zucchini noodles. Saute stirring frequently until Zucchini noodles are tender crisp, approximately 5- 7 minutes. ( Adjust cooking time if your noodles are thicker or thinner). Season with salt and pepper to taste. Add sesame seeds and stir to combine. In each bowl, place ½ the zoodles, mushrooms, brussel sprouts, butternut squash, and tomatoes, and ½ an avocado. Sprinkle with hemp seeds and drizzle with tahini if desired.